Polymorphisms in the receptor gene for the hormone oxytocin in dogs are associated with differences in social behavior towards humans in German Shepherds and Border Collies. Kis, et al 2014. Oxytocin receptor gene polymorphisms are associated with human directed social behavior in dogs (Canis familiars). PlosONE DOI: 10.1371/journal.pone.0083993. How long and low can you go? Intervertebral disc extrusion (IVDE) is a common neurological disorder in certain dog breeds, resulting in spinal cord compression and injury that can cause pain and neurological deficits. Most disc extrusions are reported in chondrodystrophic breeds (e.g. Dachshunds, Basset Hounds, Pekingese), where selection for ‘long and low’ morphologies is linked with intervertebral discs abnormalities that predispose dogs to IVDE. The aim of this study was to quantify the relationship between relative thoracolumbar vertebral column length and IVDE risk in diverse breeds. A 14 month cross-sectional study of dogs entering a UK small animal referral hospital for diverse disorders including IVDE was carried out. Dogs were measured on breed-defining morphometrics, including back length (BL) and height at the withers (HW). Of 700 dogs recruited from this referral population, measured and clinically examined, 79 were diagnosed with thoracolumbar IVDE following diagnostic imaging ± surgery. The BL:HW ratio was positively associated with IVDE risk, indicating that relatively longer dogs were at increased risk, e.g. the probability of IVDE was 0.30 for Miniature Dachshunds when BL:HW ratio equalled 1.1, compared to 0.68 when BL:HW ratio equalled 1.5. Additionally, both being overweight and skeletally smaller significantly increased IVDE risk. 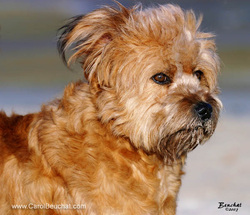 Therefore, selection for longer backs and miniaturisation should be discouraged in high-risk breeds to reduce IVDE risk. In higher risk individuals, maintaining a lean body shape is particularly important to reduce the risk of IVDE. Results are reported as probabilities to aid decision-making regarding breed standards and screening programmes reflecting the degree of risk acceptable to stakeholders. We know that the expression of a gene can be modified by other genes. Now a study has shown that the effect of the modifier gene depends on the genome it's in As you peer over the results of a battery of genetic tests done on your dog, you might need to consider that what they actually mean is a whole lot different than you think. The mutation in one dog might cause disease, but in another dog it doesn't. One dog responds to treatment, the other doesn't. You decide based on phenotype that one dog has a gene and another doesn't, but in fact they both do. A combination of genes can have one effect (positive?) in one dog, and a completely different (negative?) one in another. Bottom line - it's potentially really, really complicated. Wow. You can read more here, and there's an excerpt from the abstract of the paper below. "The phenotypic outcome of a mutation cannot be simply mapped onto the underlying DNA variant. Instead, the phenotype is a function of the allele, the genetic background in which it occurs and the environment where the mutational effects are expressed. While the influence of genetic background on the expressivity of individual mutations is recognized, its consequences on the interactions between genes, or the genetic network they form, is largely unknown. The description of genetic networks is essential for much of biology; yet if, and how, the topologies of such networks are influenced by background is unknown. Furthermore, a comprehensive examination of the background dependent nature of genetic interactions may lead to identification of novel modifiers of biological processes. Previous work in Drosophila melanogaster demonstrated that wild-type genetic background influences the effects of an allele of scalloped (sd), with respect to both its principal consequence on wing development and its interactions with a mutation in optomotor blind. In this study we address whether the background dependence of mutational interactions is a general property of genetic systems by performing a genome wide dominant modifier screen of the sdE3 allele in two wild-type genetic backgrounds using molecularly defined deletions. We demonstrate that ~74% of all modifiers of the sdE3 phenotype are background-dependent due in part to differential sensitivity to genetic perturbation. These background dependent interactions include some with qualitative differences in the phenotypic outcome, as well as instances of sign epistasis. This suggests that genetic interactions are often contingent on genetic background, with flexibility in genetic networks due to segregating variation in populations. Such background dependent effects can substantially alter conclusions about how genes influence biological processes, the potential for genetic screens in alternative wild-type backgrounds identifying new loci that contribute to trait expression, and the inferences of the topology of genetic networks." Background: Autosomal recessive hereditary nephropathy (ARHN) was diagnosed in 2 English Springer Spaniels (ESS), a breed not previously reported to be affected by hereditary nephropathy (HN). Objective: To identify and characterize the genetic cause of ARHN in ESS. This report documents the occurrence of ARHN in a family of ESS, a breed not previously reported to be afflicted with this disease. Affected ESS did not harbor the particular COL4A4 mutation that is known to cause ARHN in ECS; therefore a different mutation in COL4A4 or a mutation in COL4A3 was anticipated. Two female ESS littermates were evaluated at the Texas A&M University College of Veterinary Medicine and Biomedical Sciences (TAMU-CVM) for renal disease that was first detected when the dogs were 7 months old. Each dog's renal disease was observed to progress to a near-terminal stage over the next 2–3 months, whereupon each dog was euthanized. Mutation screening for C2806T in related and unrelated ESS identified 13 carriers out of 25 related dogs (Fig 5) and 1 carrier among 35 unrelated dogs. 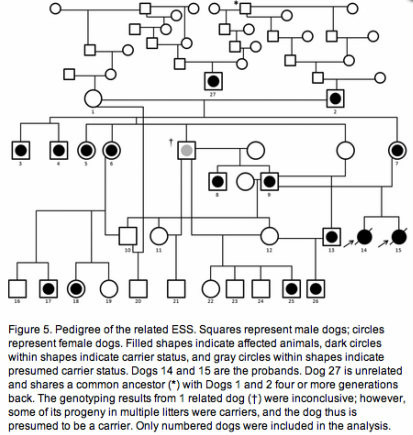 Detailed pedigree analysis identified a common ancestor for the unrelated carrier (Dog 27) and the 2 founders of the family (dogs 1 and 2) 4 generations back. The common ancestor indicates that the mutation is not de novo within the nuclear family in Figure 5, and that additional carriers within the breed are likely. Given the small number of unrelated dogs tested in this study, it is not possible to predict the frequency of the mutant allele in the ESS population. Therefore, a population study to estimate the prevalence of carriers within the breed is warranted. Nowend et al 2012 Characterization of the Genetic Basis for Autosomal Recessive Hereditary Nephropathy in the English Springer Spaniel. J Vet Int Med 26: 294-301. Objective To identify housing- and exercise-related risk factors associated with the development of hip dysplasia (HD) as determined by radiographic evaluation in Newfoundlands, Labrador Retrievers, Leonbergers, and Irish Wolfhounds in Norway. Animals 501 client-owned dogs from 103 litters. Procedures Dogs were assessed from birth until official radiographic screening for HD at 12 (Labrador Retriever [n = 133] and Irish Wolfhound ) or 18 (Newfoundland  and Leonberger ) months of age. Information regarding housing and exercise conditions during the preweaning and postweaning periods was obtained with questionnaires. Multivariable random effects logistic regression models were used to identify housing- and exercise-related risk factors associated with the development of radiographically detectable HD. Results Puppies walking on stairs from birth to 3 months of age had an increased risk of developing HD. Factors associated with a decreased risk of developing HD included off-leash exercise from birth to 3 months of age, birth during the spring and summer, and birth on a farm. Significant clustering of dogs with HD was detected within litters. Conclusions and Clinical Relevance Results indicated that puppies ≤ 3 months old should not be allowed access to stairs, but should be allowed outdoor exercise on soft ground in moderately rough terrain to decrease the risk for developing radiographically detectable HD. These findings could be used as practical recommendations for the prevention of HD in Newfoundlands, Labrador Retrievers, Leonbergers, and Irish Wolfhounds. Request reprints from Dr. Krontveit (randi.krontveit@nvh.no). Osteogenesis imperfecta (OI) is a genetic disorder causing defects in the development of collagen type I. Clinical signs of affected dachshunds include multiple fractures of bones, joint hyperlaxity and dentinogenesis imperfecta. Recently, a recessive mutation in the SERPINH1 gene was detected in dachshunds and enabled the development of a DNA test to identify dachshunds carrying the mutation. The purpose of the present study was to analyse the dachshund breeding population for the frequency of the SERPINH1 mutation among the nine different breed varieties in dachshunds, birth years and countries of origin. We genotyped the OI-associated SERPINH1 mutation in 1352 dachshunds from 12 different European countries including all nine varieties. Genotyping was done using a restriction fragment length polymorphism validated by DNA sequence analysis. The overall frequency of OI carriers was 12.9 per cent. Across all different size varieties, the SERPINH1 mutation was over-represented in wire-haired dachshunds with 17.3 per cent OI carriers. Among the different countries, the proportion of OI carriers was highest in Germany with 20.4 per cent. The test is useful for dachshund breeders to prevent the occurrence of OI-affected dogs and as a diagnostic tool for veterinarians. We used to think dogs saw the world only in shades of gray. But like most mammals, they have two types of color receptors in their retinas. Humans, on the other hand, have three (except the color blind - they also have only two). So dogs don't see in wild technicolor like most of us do, but they definitely perceive color. Dobson, JM 2013 Breed-predispositions to cancer in pedigree dogs. ISRN Veterinary Science Vol 2013 (2013), Article ID 941275, 23 pages. In the dog, the dopamine transporter gene (DAT) contains a 38-base pair variable number tandem repeat (DAT-VNTR); alleles have either one or two copies of the 38-base pair sequence. Most dog breeds that have been examined are homozygous for the DAT-VNTR allele with two tandem repeats. In Belgian Malinois, the single copy allele of DAT-VNTR is over-represented and is associated with owner-reported seizures, loss of responsiveness to environmental stimuli, episodic aggression, and hyper-vigilance in MAL. The authors caution that the findings should be considered preliminary until replicated in a larger sample.